Preheat your oven to 350oF and grease 4 mini loaf tins or line them with parchment paper. enough. Do not overmix it. temperature, but for about 1 hour, or until a toothpick inserted in the center of the loaf comes out clean. 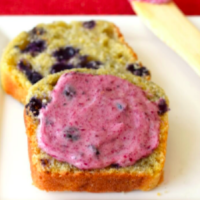 Wild blueberry buttery spread: Place 1⁄2 cup dairy-free buttery spread in a bowl and whisk or blend until smooth. Stir in 1⁄4 cup wild blueberry jam (I use Stonewall Kitchen). It will be like a thin spread, and can be used immediately or chill in the refrigerator for several hours to set up.